Whew! I just made it in time for this week's Off The Wall Craftiness Challenge. Life has been very busy for me (which explains my absence), but I made time for this challenge! I am in love with the inspiration because it reminds me of my own wedding! 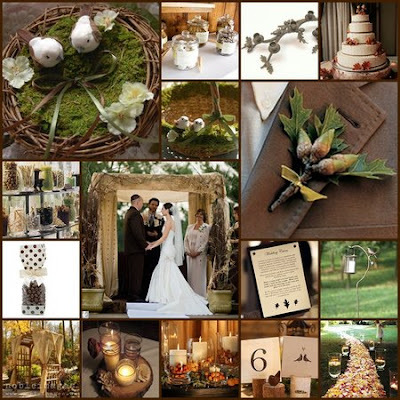 :) Our colors were very similar and we incorporated a lot of earthy and natural decorations. This card is so simple. I simply ran some Naturals White cardstock through my Cuttlebug with the PTI woodgrain embossing plate. Then I mounted it onto some Old Olive card stock. I tied a bow with some Early Espresso Taffeta ribbon and adhered my birds, punched out of some Brocade Background DSP. I added a layer of DSP on my Early Espresso card, then adhered everything onto it. I hope you like it! Very nice CAS card! Very lovely addition to our challenge! Thanks for joining in the fun and playing along with us at OTWC and Good luck! :-) Aloha!